the vital part they play in helping us deliver our services across Edinburgh and the Lothians. Our Light up a Life Campaign had another successful year. We were delighted to introduce ‘Light up a Memory’ into the mix, an interactive map allowing supporters to mark places all over the world which hold a special memory of a loved one who has died. This will continue to run year-round so please keep adding your special memories! In terms of events, our ever popular Celtic Challenge takes place in May, challenging participants to cycle from the Hospice to Iona (taking in stunning scenery along the way). A Walk to Remember returns to the East Lothian coastline in June and we’re inviting teams to get #firedupontheforth in our unique Dragon Boat Race at Ocean Terminal in August. I’d like to take this opportunity to say thank you for all of your support and I hope you will be inspired by some of the stories and news in this issue! There are lots of exciting developments across our service, all of which directly benefit the people we support and their families. It wouldn’t be possible without you. 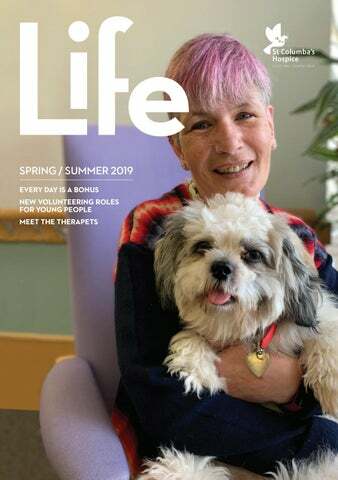 NEWS FROM THE HOSPICE TIME TO LOOK AHEAD Our strategic plan, ‘Care and Compassion’, sets out what we need to do to reach more people living with terminal illnesses across Edinburgh and the Lothians. As you can imagine, medical advances mean that many people are living with complex health and social care conditions for longer. This directly impacts our organisation as we have to continually assess and adapt our services to meet the increase in demand and changing needs of our service users. To plan ahead for our next strategy, we need input from all of our stakeholders; from the people that use our services, to our volunteers, staff and supporters. We want to hear from as many voices as possible so that we can develop something we can be proud of and something that belongs to us all. We’re confident that together, we can improve care and support for people living with terminal illness and their families. In addition to forming a strategy group, we’re welcoming comments and feedback. If you have a story to share, a small anecdote or a special memory – please share it with us. Simply email info@stcolumbshospice.org.uk. RETAIL UPDATES Haddington is now open! Some great news for our East Lothian supporters – we’ve opened a shiny new charity shop and community hub at 67 High Street in Haddington. The shop which opened in early February, has had a wonderful start bringing in over £600 on the first day of trading. A big well done to the newly formed team. Shop Manager Alex is welcoming donations of high-quality clothing, shoes, books and bric-a-brac. Our community team will work from the hub offering information, support and advice on our services and how to access them. In addition, we'll be hosting drop in sessions and support groups. More information on this extension to our service soon. Railway raffle raises £1031! A special mention for David Flucker who donated a handmade model railway to raise money for the Hospice. Over 1000 tickets were sold and the lucky raffle winner kindly donated the model to Letham Park Nursing Home. Thank you to David, the team at Ocean Terminal Shopping Centre and everyone who bought tickets! HOSPICE LOTTERY Did you know that if you play the Hospice Weekly Lottery, you could win a cash prize every week? It’s a fun way to support our work and for only £1 per play, you’ll be in with a chance of winning up to £1000. Visit our website for full terms and conditions and to sign up today. PHOTOCARDS For patients and visitors to the hospice, one change you may notice is that all staff and volunteers now have photos on their name badges. This was in response to feedback you gave us and in addition to being an improved security measure, we hope this will help you in familiarising yourself with the team. GET INVOLVED IN 2019 Throughout 2019 we will be letting you know about exciting new ways to get involved with the Hospice, whether that is through joining our team of volunteers or by taking part in events, such as the Giant Pub Quiz, A Walk to Remember East Lothian, or the Kiltwalk. Make sure you check out our events calendar for 2019 on pages 22 and 23. You can also keep up to date by signing-up for our email newsletter via the website where you’ll find all our latest news. NEW VOLUNTEERING ROLES FOR YOUNG PEOPLE Did you know that St Columba’s Hospice has involved young people in volunteering roles since it opened in 1977? Infact, our current In-patient Unit manager Richard MacKay was a volunteer on the wards when he was just 16 years old! One of the great things about this is that we are actively helping young people shape their future by giving them hands on experience in different areas. This in turn, helps them with applications for further education and employment. Maggie Young, Deputy Volunteer Services Manager, recognised the value of volunteering from school age, and wanted to build on the existing model to offer more opportunities and a wider variety of roles across different departments to young people in our community. Teams across the Hospice were keen to support the project, and worked with Maggie to refresh and develop the types of roles we can offer. “The Hospice has a really vibrant community feel and it’s so lovely to be a part of that” Annie May Adams, Reception Volunteer. CHOOSE A GIFT THAT MAKES A DIFFERENCE LOOKING FOR THAT PERFECT GIFT? WE’VE PUT TOGETHER OUR TOP FIVE GIFTS OF THE SEASON TO HELP YOU PICK SOMETHING FOR THAT SPECIAL SOMEONE. THE BEST BIT IS, EVERY GIFT ON OUR LIST COMES WITH THE KNOWLEDGE THAT YOU ARE MAKING A DIFFERENCE TO PEOPLE LIVING WITH TERMINAL CONDITIONS ACROSS EDINBURGH AND THE LOTHIANS. 1. A CUDDLY TOY Our classic branded teddy bear is a firm favourite in the gift shop, so, you’ll be pleased to know it now comes in pocket sized version. Keep your keys safe with this adorable accessory and never have to leave home without your cuddly friend again! 2. A COMFORTING SCENT If you like the idea of your home smelling like a warm summer day, or are on the look out for a housewarming gift, why not pick up a diffuser or candle? This summer, we’re excited to bring you a limited edition scent, Scottish Rose – the perfect gift for the one you love. from one of our featured jewellers. If you love nature, you’ll love the handmade silver earring, necklaces and bracelets we have from Alexis Southam. 4. SWEET TOOTH Sweet treats make delicious gifts and that’s just what you’ll come across in our irresistible range of yummy, Scottish treats. From tablet to fudge and strawberry bon bons, they never fail to remind us of our childhood. Pick up a packet for the kids or to satisfy the sweet tooth in your life! 5. SQUEAKY CLEAN We love the variety and choice of soaps on offer from The Perfume Studio. One of the best sellers has been Lemongrass but you can also get Lavender or Wild Mint and Fennel. The soaps are part oif a wider range of toiletries all hand made here in Scotland. COMMUNITY CORNER LET’S GET TOGETHER Last year Rolling Hills Chorus, Forth Valley Chorus and The Gilmerton Singers joined together to fundraise for the Hospice. Their very successful concert raised £3,300 and was enjoyed by all those who attended. The members have also been a great support, providing musical entertainment at our events and also fundraising at their own concerts. SUMMERSIDE BOWLING CLUB Our friends at Summerside Bowling Club are celebrating their 150th anniversary this year and we’re taking this opportunity to say massive thank you for their support. The club members have been fundraising for us since 1984 with a running total of £54,600 raised to date! 23RD CRAIGALMOND SCOUTS, BEAVERS AND CUBS Over 100 members of the 23rd Craigalmond Scouts, Beavers and Cubs have been very busy and creative in their fundraising. The groups chose sponsored activities including a fun run and keep fit session. Our community fundraiser had a great time visiting the groups to tell them about the Hospice and cheer them on during their fun run. Even though it was a miserable day they all had a smile and did an impressive number of laps of the park! In total they raised a brilliant £1355. Dawn Neil and family after their Ceilidh, 'Fionaâ&#x20AC;&#x2122;s Fling'. HOW TO GET INVOLVED We love working with our local community and are here to help with inspiration, fundraising materials and advice. If you want to fundraise, learn more about the Hospice or help out with our community activities please contact our community fundraiser by emailing fund@stcolumbashospice.org.uk or calling 0131 551 1381. EVERY DAY IS A BONUS PAMELA CURRAN DECIDED TO COME TO ST COLUMBA’S HOSPICE FOR PAIN MANAGEMENT AT THE END OF LAST YEAR. DURING HER MONTH-LONG STAY, PAMELA RECEIVED SPECIALIST TREATMENT WHICH ALLOWED HER TO GET HER PAIN UNDER CONTROL AND TAUGHT HER WAYS TO HELP MANAGE THE PAIN HERSELF. NOW LIVING BACK AT HOME WITH HER GORGEOUS PUPPY, MYLA, PAMELA CONTINUES TO RECEIVE SUPPORT FROM OUR COMMUNITY TEAM AND WANTED TO SHARE HER POSITIVE EXPERIENCE WITH OTHERS… job as I found I was getting tired very quickly. It was while under the care of the Western that I was introduced to Dr Laird who consults in Palliative Medicine at the Edinburgh Cancer Centre, as well as the Hospice. Dr Laird visited me several times over the course of a few weeks to review my condition and help to get my pain under control. He advised that he thought it would be beneficial for me to come to the Hospice to get pain management treatment. going to give me a bath; it was so relaxing and helped so much with my pain. I also used the art room where I decorated my walking stick with dry flowers and I’ve even had massages and my hair and nails done. To me, the whole place feels like a five-star hotel because the food is absolutely amazing, everybody would do anything to help you, and everyone is so polite and happy. I could go outside when I wanted to, wander around the grounds or go to the café. The nurses would always check I was okay, so it felt nice to have the freedom to do my own thing in a safe environment. It was great. “They have thought of everything and I have nothing but admiration for the team of staff and volunteers.” treated like a person, not a patient. I made lots of friends and It was nice to meet new people that knew what I was going through in such a supportive environment. MEET THE THERAPETS MEET THE THERAPETS BRINGING JOY TO OUR PATIENTS, STAFF AND VOLUNTEERS. WEâ&#x20AC;&#x2122;RE DELIGHTED TO NOW HAVE TEN THERAPETS ON BOARD, MEANING WE CAN OFFER OUR PATIENTS A VISIT EVERY WEEKDAY! WE TOOK SOME TIME OUT TO GET TO KNOW A FEW OF THEM A BIT MORE. Brodie's favourite food is chicken and his favourite toy is a stuffed monkey. He loves to nap at the end of his mum's bed and his party trick is that he can jump super high. Cedric Yassie Yassie's favourite food is cheese! She loves to nap on the settee in the conservatory and her favourite place to explore is in and around the woods at Craigie. Cedric's favourite place to explore is the beach and his favourite toy is a Golden Retriever puppy named Dornoch after the town from which we purchased it! His favourite food is probably fillet steak, followed closely by smoked salmon, both of which, he gets as a special treat just once a year! Molly Molly loves exploring the great outdoors and playing with her ball. She enjoys her kibble but is also partial to chicken or as a special treat a slice of hot buttered toast. Her party trick is taking socks off and her favourite nap spot on her mum's bed! George George loves to nap on top of a pile of cushions and his party trick is rugby tackling his owner round the legs when he has a point to make! His most loved toy is a tiny stuffed felt mouse that he sleeps with every night. He loves exploring the top shelf of the wardrobe. Brodie's favourite place is Cramond/ Silverknowes as he loves the water and rolling in the sand. His favourite food is anything edible (apart from tomatoes) and his party trick is chasing his tail. Brodie's favourite toy is a large toy retriever! FROM THE AMAZON TO THE DEEP BLUE SEA apparent that the visual experience has the power to evoke positive memories, heartwarming conversation and in some cases, reduce anxiety and stress. One man was reported by staff to be smiling and chatty for the first time since his admission. Another joked that it was almost worth being admitted to the hospice to have the experience. They were all keen to try it again if it was ever available. BEHIND THE SCENES: Steven McLeod HAVE YOU EVER WONDERED WHAT HAPPENS AT THE HOSPICE BEHIND-THE-SCENES, OR WHAT IT WOULD BE LIKE TO BE PART OF THE TEAM? STEVEN MCLEOD HAS BEEN WORKING AT THE HOSPICE FOR SIXTEEN MONTHS AS DOMESTIC CHARGEHAND AND SHARES HIS EXPERIENCE HERE… What did you do before you joined the Hospice? Before starting at St Columba’s Hospice I worked in retail management for pretty much all of my adult life. My last position was night manager in a supermarket. I have worked in Edinburgh’s busiest stores and travelled all over Scotland to help with new store openings. Tell us about a day in the life of a Domestic Chargehand. The domestic staff work over two shifts, an early and a backshift. The ladies from the early shift can be found on Pentland and Cedar wards doing a great job keeping the patients rooms and surroundings clean. I work with a small dedicated team on the backshift. We make sure the staff offices, day therapies, basement and education centre are clean, tidy and in good order. I can sometimes be found helping in the laundry which is a very busy department in the Hospice, we launder over 80,000 tonnes each year! There’s always lots to do here so you’re on the go constantly. It’s a great team to work with who will always go the extra mile to get the job done. How does your role help patients and families? Our role as domestics helps make the environment clean, comfortable and safe for patients, families, volunteers and staff. We also have some interaction with patients and their families (especially those on the early shift). Some enjoy a bit of banter and others a quick chat, these small things go a long way in making the patients stay at the hospice as comfortable as possible. What is your favourite thing about working here? I think my favourite thing about working here is the people - they are friendly, positive and dedicated to making the Hospice a success which must be comforting for patients and families. It’s a very nice place to work. CORPORATE CORNER It’s been such a pleasure building relationships with our corporate partners over the last year. As our current Charity of the Year partnerships come to an end we would like to give a huge thank you to the teams at BlackRock, Ocean Terminal, Royal Bank of Canada, the Institute and Faculty of Actuaries and Davidson Chalmers for their wonderful support and enthusiasm. We’re delighted to welcome Mackenzie Hughes and Hallhill Centre in Dunbar as new partners and also very happy and thankful to be continuing our partnership with our friends at the TSB Leith branch. The last few months have been very busy for our corporate supporters! At Ocean Terminal we had teams volunteering as elves in our Santa Grotto and manning our Christmas Gift wrapping table raising £10,000 for the Hospice over the festive period – Thank you! At the end of 2018 we were delighted to be the beneficiary of a staff vote at Standard Life, Lothian Rd and gratefully received a very generous donation of £10,000. Sandra Millar, Engagement and Community Consultant for Standard Life, visiting the Hospice and handing over the cheque to staff nurse Diane. A special mention to the team at Tesco, their lovely customers and staff managed to raise over £1600 by buying and donating books at the Broughton Road branch. A huge thank you to the teams from Lloyds Banking group, BlackRock, Scottish Widows, Royal Bank of Scotland, TSB Leith branch, Expedia, HSBC, Chiene & Tait, Edinburgh University, Ernst & Young, Royal London, Companies House, John Lewis Partnership, and the Scottish Government Social Security Policy Division. Whether helping in the gardens, taking part in team building days at our shops or participating in a variety of fundraising activities, they always rise to the challenge! Scottish Gas volunteers helping maintain our Tribute Garden. Recently, Dawn Neil, one of our fantastic fundraising volunteers, put us in touch with Chef Dominic and his team at the Castle Terrace Restaurant. Over the course of a month, customers were given the option to add a donation to the Hospice on to their bill which resulted in a donation of £1177! If you have any connections with other restaurants in Edinburgh or East Lothian who might also consider supporting the Hospice in this way, please get in touch the Fundraising team and we will happily contact them! We’re also very grateful to our corporate partners who regularly donate gifts in kind. We receive regular food donations from the Lidl Granton branch, M&S at Ocean Terminal, Sainsbury’s Local on Bernard St and Howe St. All the donations are gratefully received by our team in the kitchen. We are always humbled by the amount of time and effort our corporate friends put into Fundraising for the Hospice, on top of busy working lives! THANK YOU again. We held our first Corporate Networking event in November at BlackRock. Many of our corporate supporters attended to hear a little bit about what is new at the Hospice, and also to hear an inspiring talk by Sean Conway (extreme endurance adventurer). It was a great way for our supporters to meet each other and for the Hospice team to thank our corporate partners. TOFINO TO FIFE MATTHEW WATERSTON’S MOTHER ANDREA WAS DIAGNOSED WITH TERMINAL MELANOMA SKIN CANCER IN 2014 AFTER COMPLAINING OF SEVERE BACK PAIN. JUST TWO MONTHS AFTER HER INITIAL DIAGNOSIS, ANDREA PASSED AWAY AGED 64. Prior to her diagnosis, Andrea cared for Matthew’s father for 5 years as he battled Parkinson’s and Dementia. Following her death, Matthew took over his father’s care, along with an amazing support network of medical staff, carers, friends, family and his girlfriend, Hannah. In September 2016 his father, William Waterston, passed away peacefully, aged 67. Although Matthew had not envisaged caring for his father in his mid-20s, he reflects that being able to spend quality time with him brought them closer and created happy memories to cherish. In memory of his parents, they will cycle from Canada where his mother was raised to St Andrews, Scotland where his father was born. Their plan is to cycle the width of Canada (6400km in 36 days), and then fly immediately back home and run across Scotland (290km in 7 days). Matthew and Hannah have decided to take on a challenge to raise money for the charities that helped them through such a difficult time. The target is £20,000 and money raised will be split between St Columba’s Hospice, Alzeimer Scotland and MacMillan Cancer Support. You can keep up with the challenge via Instagram (@tofinotofife) and find out more and donate by visiting https://uk.virginmoneygiving.com/TofinotoFife Good luck Matthew and Hannah! Their plan is to cycle the width of Canada (6400km in 36 days), and then fly immediately back home and run across Scotland (290km in 7 days)! ARTS STRATEGY The arts are integral to who we are and how we relate to others and the world around us. Engaging in the arts can be a shelter, transcend words and offer emotional support in times of change. Recognising the transformative potential of arts in human life, St Columba’s Hospice is committed to promoting patient and family wellbeing through the use of expressive arts. In September 2018, Giorgos Tsiris was appointed as the Arts Lead for the organisation. Building on a strong tradition of artistic endeavour at the Hospice, the newlyestablished arts service focuses on further developing the Hospice’s identity as a creative and arts-active organisation. This includes the integration of the arts in patients’ and families’ care as well as the Hospice’s engagement with the local community. Currently, the Art Room on Pentland Ward is open daily for use by those in the inpatient unit and their visitors. Open arts group sessions are offered. A little help from our friends As part of our ongoing Art Strategy at the Hospice, we now have a popular and well-used Art Room adjacent to the Pentland Ward. In order to help us display the creative works of art, IKEA Edinburgh donated 38 frames worth almost £400. A huge thank you to the team at IKEA for this generous donation. The frames will be well used and appreciated! 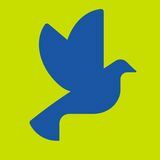 Monday (2-3:30pm) for bereaved relatives (led by Suzie Stark, Chaplain) Tuesday (11-1pm) for inpatients and community patients (led by Gwen Rayner, Art Volunteer) Every second Thursday (1:30-2:30pm) for the inpatient unit and Day Therapies Service (led by Linda Small, Chaplaincy Volunteer). St Columba’s Hospice is a registered charity. EVENTS CALENDAR THE GIANT PUB QUIZ THURSDAY 18 APRIL, EDINBURGH CORN EXCHANGE TICKETS: £15, TEAM OF 6: £75 Join us at our spring Giant Pub Quiz, kicking off at 7pm. Round up your most intelligent friends (or those with knowledge of the obscure) for this fantastic evening, testing your general knowledge for a chance to win some fantastic prizes. Tickets also include a pie and a pint. A WALK TO REMEMBER SATURDAY 22 JUNE, EAST LOTHIAN £15 ADULT, £10 CHILDREN 2018 saw us take our fantastic events out to East Lothian with A Walk to Remember. You can choose to walk 13.5 or 5.5 miles from Portobello or Cockenzie to our finish point in Aberlady, along the stunning East Lothian coastline. There will be more information soon, so keep an eye out on our social media. Get on your bike for the Celtic Challenge, our epic 200 mile cycling event. Cycle from the Hospice in Edinburgh to the beautiful Isle of Iona in just 4 days, taking in some of Scotland’s most stunning scenery and top rated cycling routes. Take part in a unique and thrilling fundraising challenge by abseiling 165ft from the iconic Forth Bridge onto the beach below. This event is suitable for experienced and novice cyclists alike, with a training plan provided to ensure you are in top condition to enjoy yourself during the challenge. Limited places available for this highly popular event, so get in touch today to secure your spot. EDINBURGH MARATHON FESTIVAL 25-26 MAY, EDINBURGH Fast and flat, the Edinburgh race routes for the 5K, 10K, Half Marathon and Marathon, take in many of the capital’s iconic landmarks and picturesque views along the East Lothian coastline. Runner’s World voted the EMF the fastest routes in the UK – ideal if it’s your first time or for setting a new personal best. The Forth Bridge Abseil is a real adrenaline rush for the daring and the ultimate challenge for the rest of us! No previous experience is necessary to take part and no training is required. A SUMMER TO REMEMBER AUGUST 2019 Dedicate your bunting to a loved one and join us for our Summer to Remember event to celebrate our loved ones and enjoy an afternoon of music, entertainment and refreshments with glorious views over the Firth of Forth. By supporting our Summer to Remember appeal, and attending the event with your family and friends, you're helping us reach more people in the community that need us. DRAGON BOAT RACE 31 AUGUST 2019 Last year we introduced an exciting new event in partnership with Ocean Terminal. Our first ever Dragon Boat Race saw teams get fired up on the Forth and battle it out for the title of Dragon Masters and the coveted winner’s trophy. We can't wait to see more crews battle it out at this year’s brilliant event, so assemble your teams and contact the Fundraising team. most established artists and emerging talents. Everything on display is for sale and the exhibition is the perfect opportunity to walk away with a fantastic new addition to your home. GIANT PUB QUIZ WEDNESDAY 13 NOVEMBER, EDINBURGH CORN EXCHANGE TICKETS: £15, TABLE OF 6 £75 Join us at our winter Giant Pub Quiz, kicking off at 7pm. Round up your most intelligent friends (or those with knowledge of the obscure) for this fantastic evening, testing your general knowledge for a chance to win some fantastic prizes. Tickets also include a pie and a pint. LIGHT UP A LIFE MONDAY 9 DECEMBER THE EDINBURGH KILTWALK SUNDAY 15 SEPTEMBER 2018 was the biggest Kiltwalk yet with over 5,000 people walking through the capital. All participants taking part will receive an additional 40% fundraising boost from The Hunter Foundation – even more reason to participate in this fabulous fundraising event. Christmas at the Hospice starts with our annual Light up a Life Appeal, when we ask you to dedicate a light on our Tree of Remembrance in memory of a loved one. Our lighting ceremony takes place at Charlotte Square Gardens and draws thousands of people each year – everyone is welcome. SCOTTISH HALF MARATHON SUNDAY 22 SEPTEMBER The Scottish Half Marathon route is flat and rapid, so if you want to set a personal best for a half marathon or 10K, this is the event for you! Starting just outside Edinburgh, the running route leads along the majestic East Lothian Golf Coast before finishing in the final furlong at Musselburgh Racecourse. The latest news and stories from the Hospice.